Most of my trip expenses were covered for the purpose of review, all opinions are my own. On my recent visit to Louisiana, we had a great time exploring the areas around Lafayette, but on my last day there, we had the opportunity to spend the entire day in Lafayette, Louisiana. Lafayette is a lively college town, with a rich history and plenty to keep visitors busy. You need fare more than a day to explore this city, the fourth largest in Louisiana, but if you only have 24 hours, the following would be an ideal way to spend your day. Jolie's Louisiana Bistro is named one of Lafayette's best restaurants, and within minutes of stepping through the door, it is easy to see why. Tantilizing smells tempt your taste buds as you pass under the oppulent chandelier in the entry way next to the winding staircase. The bar glitters with it's various libation bottles from across the room, and fantastic scenes of beauty beckon from the walls. The website describes the atmosphere as "Louisiana Chic" and no words could describe it better. The restaurant itself is named after the George Rodrigue painting "Jolie Blonde" or (pretty blonde.) George Rodrigue is also the famous Blue Dog artists, and his talents are beautifully displayed in this 1974 depiction of a Cajun woman who left her Cajun lover for someone else. Rodrigue's sons are now co-owners of Jolie's Louisiana Bistro, along with Steve and Suzi Santillo. Tucked away along the banks of the Bayou Vermilion, Vermilionville allows guests to step back into the past. Titled with the original name of the city of Lafayette, this 23-acre site focuses on recreating life from 1765-1890 in an early Acadian settlement. It is the largest representation of early Acadian life in the world, and seven completely restored and original homes from the period. Throughout this popular folk life attractions, guests will get glimpses of a school house, Catholic church, Acadian homes and more. There is a blacksmith area, detailed and authentic gardens, and beautiful views of the Bayou all along the way. Artisans can be found in buildings along the way, who display various crafts and handy work from that period in history. Once such artisan is Merlin Fontenot who has been found playing his fiddle at Vermilionville for the last twenty years. Merlin is a true Cajun gentleman, with a very interesting and successful past, in fact, he has played on the Grand Ole Opry stage twice in his 91 years. Relax and take in daily live music at Vermilionville each day, or grab a bite to each in their cafe. There is plenty to do for the whole family at this authentic Louisiana attraction. Vermilionville is open Tuesday - Sunday 10 a.m. - 4 p.m. Admission is $8 for adults and $6 for children, with children under 5 getting in free. A day in Lafayette, Louisiana would not be complete without a trip to see the Cathedral of St. John the Evangelist. It is the third church to be built on the land donated in 1821 to the church. The current cathedral is built in a Dutch Romanesque style, and was completed in 1916. Even if you are not religious, you can certainly appreciate this tall brick masterpiece of architecture that is on the national registry of historic places. For authentic Cajun cuisine, atmosphere and music, look no further in Lafayette than Prejean's. Besides incredible food, and fun Louisiana swamp inspired decor, the restaurant offers guests a unique experience to say hi to loved ones back home. The Prejean's webcam is located within the restaurant's main dining room, and allows you to see the live entertainment and diners on their website. Want to taste a little of a lot? Try the Crawfish Platter, which features samplings of fried crawfish, crawfish etouffee, crawfish cornbread pie, crawfish boulettes and crawfish bisque, or Prejean's Seafood Platter served fried or grilled with a variety of fresh caught favorites like alligator and frog legs. One this is for sure, Prejean's is sure to provide a delicious ending to your day in Lafayette, Louisiana. oh, WOW! These are some yummy looking restaurants! I'm homesick now. (grew up in SE Texas) and I remember places like this! I'd love to visit! Stuffed French Toast (Angel food cake stuffed with cream cheese with macerated strawberries) - HOLY COW! I'd travel there just for that! Was it as amazing as it sounds?! LOL Stephanie, I heard that it was insanely good. My meal was actually the grits and grillades, which was wonderful. I couldn't resist taking a picture of the french toast though. What a gorgeous post. I've always wanted to visit Louisiana - the history, the food, the sights! My brother used to live in LA, but I haven't been there in forever. Your pictures are making me die to go back! Especially all of the food pictures! I really wish I could make that happen. It all sounds so interesting! I went to that area in my teens and have wanted to return ever since. I've actually never been down there but it just goes to show never judge a place by its cover. That first restaurant I'd probably not even walk into normally because of how it looks but it is darling inside and the food looks great. I wanted to try everything you showed. Yummy. Course it is 7am and now I'm hungry. I've actually never tried fried green tomatoes and those look great. It really is a beautiful little chic restaurant inside, the their brunch is done really well. They are also open for lunch and dinner during the week, but I would recommend the brunch most of all. In south Louisiana one should not judge a book by it's cover. Open the cover and go in, the culture alone is worth the trip. 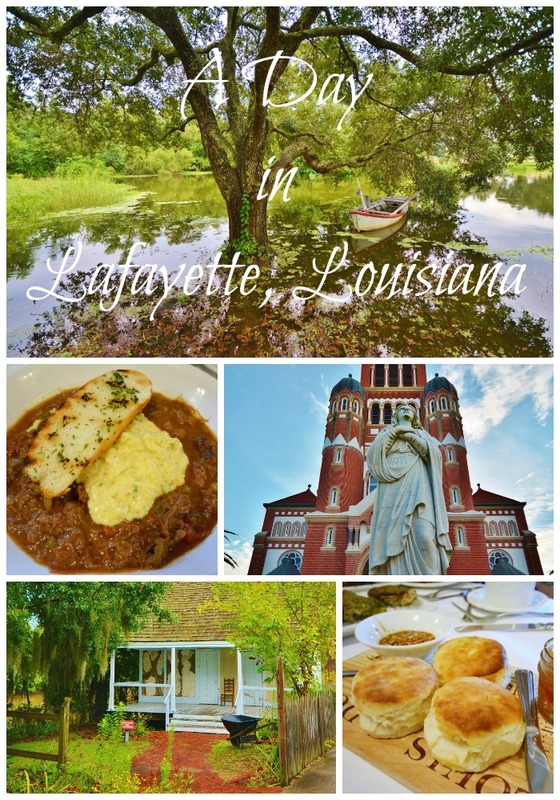 Your photos make me want to visit Lafayette! That foods like very unique and delicious. Plus, Lafayette residents are wonderful people. They absolutely are, we didn't see anything but smiling friendly faces the whole time we were there. What a fabulous cultural experience. One of my bucket list items to eat cajun in the south, it looks amazing. I always look forward to your beautiful photography in your posts, you have visited so many amazing places! I went to high school and college in Lafayette - I go back every chance I get and I've had a lot of chances in the last 45 years.